Counters nuclear radiation - devices used for registering charged particles, neutrons and gamma radiation. Counters nuclear radiation are classified by the nature of physical processes that cause electrical impulses: gas discharge, scintillation; semiconductor and other Most wide application is found with gas-discharge and scintillation counters. Gas-discharge counters nuclear radiation have the form the cylinder axis which stretched metal thread. The cylinder wall - negative electrode and the thread - positive electrode. In the cavity of the cylinder is a gas at low pressure. To the electrodes is brought high voltage. Free electrons and positive ions formed in the volume counter nuclear radiation flying charged particles, moving to the electrodes and, settling on them form in the outer circuit of electric pulses. At registration of fast neutrons ionization in the volume counter nuclear radiation is due to the recoil, which are formed at interaction of neutrons with atoms of hydrogen containing gas that fills the volume counter. 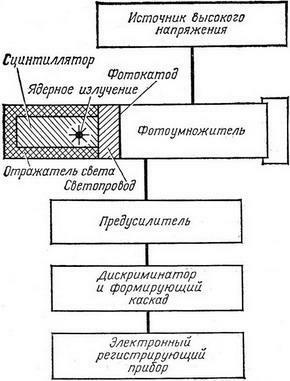 During registration of gamma-radiation ionization mainly produce electrons, knock from the walls of counter nuclear radiation. The type of gas-discharge counters is widely used in different fields of physics, biology, medicine, industry and technology Geiger - Muller. Due to the sharply non-uniform electric field created by a cylindrical cathode and anode in the form of a thin thread in the working volume in the formation of at least one pair of ions occurs electrical discharge. Arising in the external circuit of electric pulses after amplification registered electromagnetic counter. Scintillation counters (Fig) for registration of nuclear radiation consists of a scintillator, PMT (see Photomultiplier tube) and electrical circuits. In the scintillator ionizing particle causes the outbreak of luminescence, which is using the PMT is converted into an electrical impulse. Scintillation counters are widely used in medicine, in particular the scintillators are sensors in counters of the radioactivity in the body. These counters provide an opportunity to determine the content in the body of various natural and artificial γ active and hard β-active isotopes and set the behavior of these isotopes in norm and pathology. Recently a wide application for registration of electrons, gamma rays and heavy particles received semiconductor counters nuclear radiation. Electric impulse is formed by the movement of electron-hole pairs generated by passing ionizing particle. Due to the small size and absence of high voltage power semiconductor counters can be used with success in medical radiology. Cm. also Dosimeters of ionizing radiation.